By David Friedman (Turner 2018). Psst! Maybe someone should have told David Friedman, well-known media personality as well as the author of this new look at food issues – there are hardly any vegans. So if you pitch a book on 'how to eat' to that crowd, you take the risk of ending up preaching to a much reduced congregation. Add to which the serious vegans in town won't like some of what Friedman has to say, because vegans don’t eat eggs and certainly don’t eat fish. All of which only goes to show, that food is a pretty controversial and divisive issue these days, and if you want to be honest, as Friedman evidently does, you're going to have to risk trampling on the dearly held, indeed dearly munched, beliefs of lots of people. But I hope Food Sanity does find that wider readership, because I’ve read a lot of books and articles recently about food and this one really does clear out a lot of the deadwood and present some pretty mind-boggling facts (and figures) to ‘put the record straight’, as Jack Canfield (of Chicken Soup for the Soul fame) puts it, by way of an endorsement of the book. Take one opening salvo, that as I say, will surely lose Friedman lots of readers in one fell swoop: the Paleo or ‘Caveman’ Diet. This is probably the most popular diet going and that’s likely because it fits so excellently people’s dearly held prejudices. Plus, it allows them to eat lots of beef-burgers and chips, while cutting out things like muesli which only hippies eat anyway. But oh no, Friedman has done his research and found out that Stone Age folk didn’t really eat lots of red meat washed down with a beaker of blood, as we like to imagine. 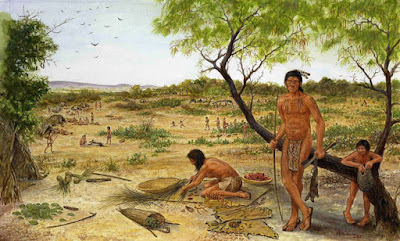 Instead, using both archaeological and anthropological research as a guide, he says that the earliest human tribes spent most of their time eating fruits and seeds, which they gathered, and probably only really sharpened the spears (or so, at least, I imagine) for internecine human disputes. Friedman finishes his deconstruction of Paleo by consideration of human biology too: notably the fact that we just aren’t built to catch our fellow animals. We lack the right claws, teeth and general physique too. He points out, a thing curiously overlooked, that Stone Age people would have been rather short and squat - not the fine figures wielding clubs that we imagine. He retells Jared Diamond’s tale of a hunting trip by one of today’s last remaining ‘stone age’ tribes, in New Guinea. At the end of the hunt, the tribe had caught only some baby birds, frogs and mushrooms. This is all fascinating to me, but compelling too are Friedman’s physiological observations, most particularly on the acidity of the human stomach. The gastric fluids of carnivores are very acidic (pH 1), which is essential if they are to break down the proteins and to kill bacteria. Our stomachs, however, are much less acidic (pH 5), and simply can’t tolerate much uncooked meat. And if, yes, Stone Age man might have done a bit of cooking, it would probably have been rather rudimentary with parts of the meat not really cooked. Actually, by the time I had finished reading all of the reasons that ‘humans can't eat meat’, I was left puzzled by Friedman’s conclusion which was that a significant proportion of the prehistoric human diet (nonetheless) seems to have been meat. Less surprising was Friedman’s hearty endorsement of eggs, which surely everyone has heard by now are really not dangerous, and don’t cause heart attacks after all, and fish, which he carefully defends form claims that they are today dangerously contaminated with things like mercury. There is, to be honest, a bit too much bad news in this book - so much so that I started to skip some sections, which fortunately the book’s modular structure permits. On the other hand, Friedman makes an effort to leaven the mix by including some good news and positive suggestions, including a two page table of the healthiest foods on earth. What are they? They're all fruits and veggies - the things that Plato and Pythagoras were praising and recommending nearly three thousand years ago. It seems that it’s time, if not indeed long overdue, to go back to following their advice. This is very interesting, Tessa. I read so much against dairy now, it begins to be considered worse than meat! But I have always felt that a certain amount of dairy is reasonably consistent with animal welfare. This is a very good example of how that might work. My borrowing words from the title of David Friedman’s book, I ponder this: with enough time might ‘food sanity’ become someone else’s ‘fad’ or ‘fiction’? And, not inconceivably, might the reverse occur — with erstwhile ‘fads’ and ‘fiction’ cycling back to ‘food sanity’? And yet back again, seesaw-like? The gyrations of research into food and health and the resultant shifting sands of dietary assurances and guidelines — which the public often finds unsettling — suggest so. This book aside, I’ve wondered, to pick up on a more general matter, what might prompt folks to regard a Paleolithic diet as the model to emulate. Sure, the evocative names of diets in general, intended to conjure warm-and-fuzzy images and ideals, are every bit the secret sauce of an industry’s marketing strategy. And in that vein, cleverness, inspiration, originality, and resonance with the public’s imagination count, to create 'wants'. All industries sip from that fountain, of course. Besides, I get that literalness might not be the bar to reach for in framing marketing messages. Regardless, I find it hard to swallow that people who lived many millennia ago would happen to ‘eat healthily’ — a term itself notoriously pocked with landmines — based on the availability of food within gathering or stalking distance of home, and how to prepare it. Not to get persnickety, but does the uninspiring average age of death of Paleolithic people — even setting aside the startlingly sharp spike in infant and child mortality and other ways that life was lethally brutish in a Hobbesian sort of way — inspire people today to model their meals on modern-day equivalents of what those earlier people happened to consume? This raises a few philosophical questions. Is it the end of humanity to be what we were designed to be? But then, what were we designed to be? Compassionate to animals? No. That is notably absent from this post. Living in harmony with the human organ systems? Whatever that might be. And would we change society for that? Thanks for these thoughts to chew over! Re. Keith, I think the idea about following stone age diets is not that they are particularly well-thought out, but that the human body is somehow used to these diets. The conceptual problems are that 'stone age people' seems to have been quite varied, and secondly, that what the human body is used to changes over relatively short periods of time. I suspect we are now all used to lots of caffeine, for example, in our diet, dare I add sugar too? Re. Thomas on the animal question, well, David Friedman does offer several examples of animal suffering to back up his preferred menus.